Very easy to miss are the out of the way borders/corners when I’m out with my camera. The window view below from just above the Acer isn’t clear at the moment. 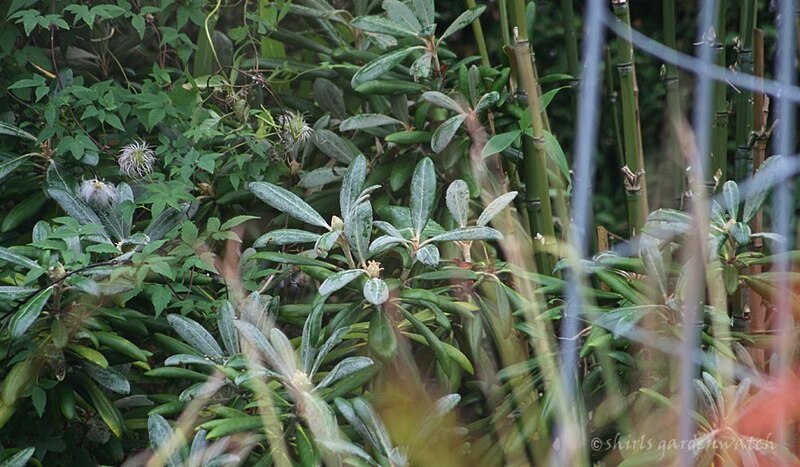 But you can see stems of Bamboo on the right. I’ve been seriously thinning this plant and it has transformed the area. 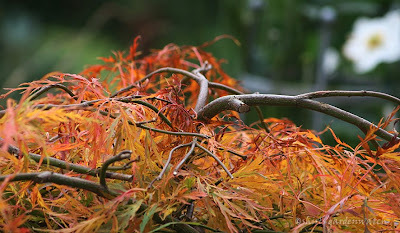 I am now finding myself looking past the wonderful Autumn glow from my Acer and admiring this background border. It’s not so easy to miss now. Sightings of butterflies in my garden I have missed seeing this year. I find them easy to miss. 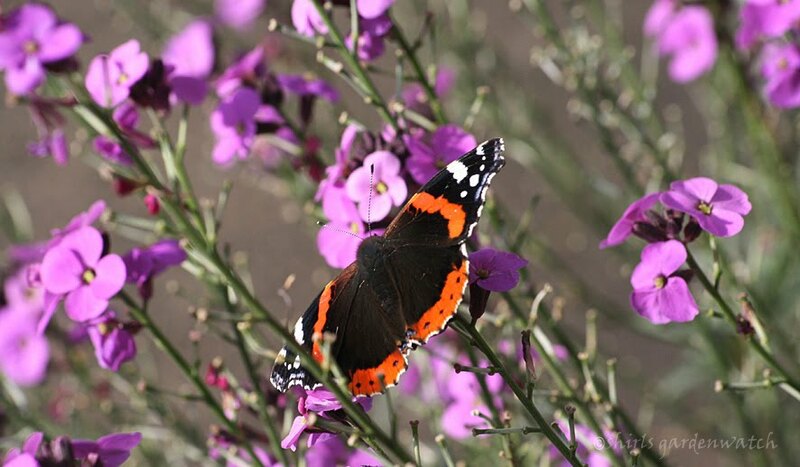 Usually butterflies are seen in warm sunshine and the best spot for me is in my front garden. Unfortunately, the gardens surrounding my front garden don’t have many flowers so being realistic this does reduce the chances of groups of butterflies stopping by. Wonderfully, this was not the case yesterday and I was thrilled to see not one but three Red Admirals feeding on my perennial wallflower, Bowles’ Mauve just outside my front door. Not so easy to miss this time. I hope we see more sunny days and they visit again. Hedgehog Hamish, I hope we will see again too. Hedgehogs can be easy to miss as they visit our gardens mostly after its gets dark. 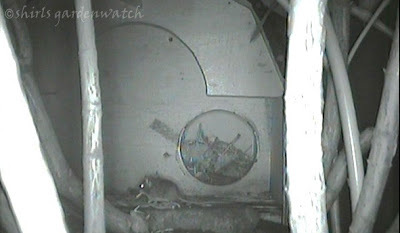 Even with a night cam it is easy to miss their visits unless you have a set up that detects movement. I tend to watch live and don’t have that. 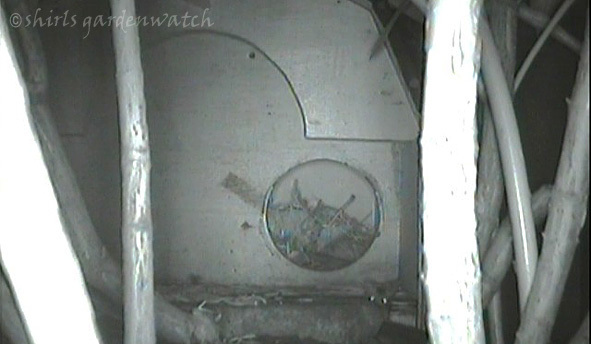 Below is a screen capture from the last video recorded visit of Hamish back on September 20th. What I did miss here was him stopping before he went down the steps and on to the feeding station which you will see in the video further below. Easy to miss there for me - but not necessarily so for Hamish! I wonder if he heard something or more likely smelt something of great interest to him. I’m thinking the later now. The photo above shows what I had missed seeing completely when I was looking through my night cam. A mouse was using the small space/doorway I had deliberately left below the hedgehog house when I built the patio and steps. Although in all honesty I had hoped a wren would discover this leafy cellar, I guess I knew all along it might be a mouse. I love the size difference between the hedgehog and the mouse in the photos. The mouse image was taken a few days after Hamish was last seen. 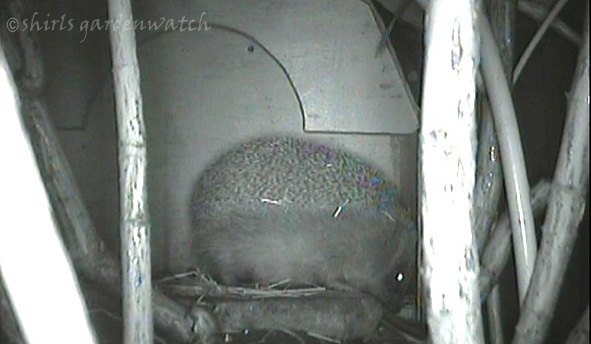 Even though Hamish and the other male hedgehog haven’t been seen visiting recently I have continued to put out food. To my surprise, with or without a night cam it would be very easy to miss what happened on this night. I never, considered mealworms to be a food that a mouse would be interested in but the video below will show just how keen it was. There is background music with this video. It was comical to watch the speed of its pick-ups and to see it adjusting the mealworms so they were central to its mouth. On occasions it managed to pick up more than one at a time too. At the end of the video you can see it stopping and appearing to notice the camera. 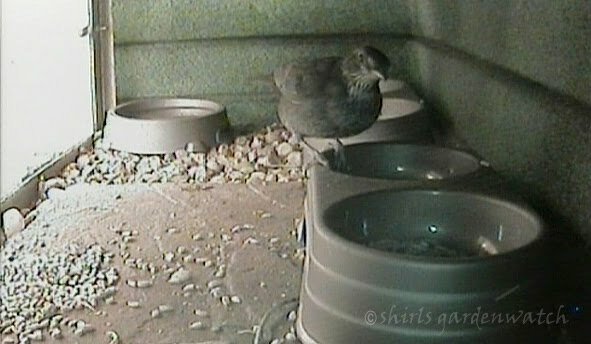 It stayed still for a moment or two before going back to collect even more mealworms. However, this was not the first opportunist of the night and most likely not the last either. The final video below shows something that I had trouble believing at the time and the story behind the title of this post. Before we watch that, let's look at the last recorded footage of Hamish enjoying the mealworms I put out on the patio and the ones in the feeding station too. He always enjoyed a drink there too. I swtiched between cameras for this one. Now, the action in this last video is very easy to miss. You will need to look very, very closely. I have no photos as there is no way a still image could possibly show what was going on. I guess even with the video footage I might have trouble convincing you. At first I thought it was the wind causing movement on the ground. Unfortunately I don’t have the best footage I could have had as I was transfixed by what I was seeing and didn’t hit the record button as early as I could have. LOL… it looked like mealworms were walking away by themselves! Of course they couldn’t be. Couldn they? LOL... looking very closely I spotted long legs and a tiny round, white body. Another ran along the patio area outside the hedgehog house distracting me a little from what happened next. I have often watched daddy-long-legs spiders in my feeding station but never seen them do this before. The first daddy-long-legs spider carried the mealworm along the ground and then, with a little bit of a struggle, carried it up the trunk/stem of my Acuba plant which shelters the Hedgehog house. I saw this happen more than once. I really was transfixed. Has anyone else ever seen the like? There is no background music with this video. 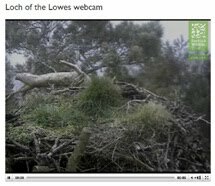 The camera view outside my hedgehog house is restricted by the stems of my plant but it has given quite a different perspective to the activity in our shrubs at night. 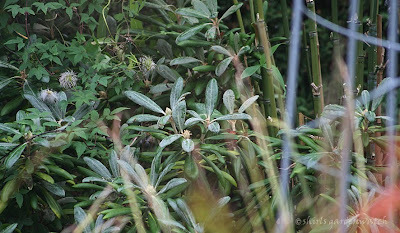 I have seen many a spider, large and small run up and down the stems of this plant. Moths will fly by. Slugs will slide up or down the stems as will forkytails which really do give me the shivers. 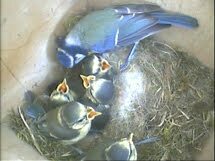 The camera view inside my feeding station has seen many slugs and snails. They are very easy to spot. They go up the walls, in the dishes of water and food. I get the shivers again. Slugs always seem interested in the sunflower hearts. They are not the only ones. 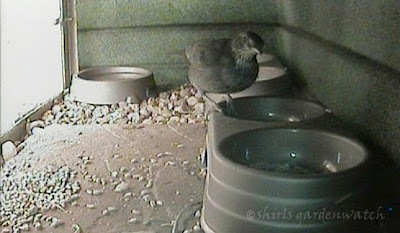 The mealworms in the hedgehog feeding station are more popular that than the sunflower hearts to Blackbirds. So, if the hedgehogs don’t come to claim them in the evenings by morning they do. The Perspex front lets in a lot of morning light which helps. I really hope passing cats find the Blackbirds in here easy to miss. The Blackbirds do seem very alert when inside and their visits don’t last long at all. Just a couple more ‘misses’ and we’re done for today. 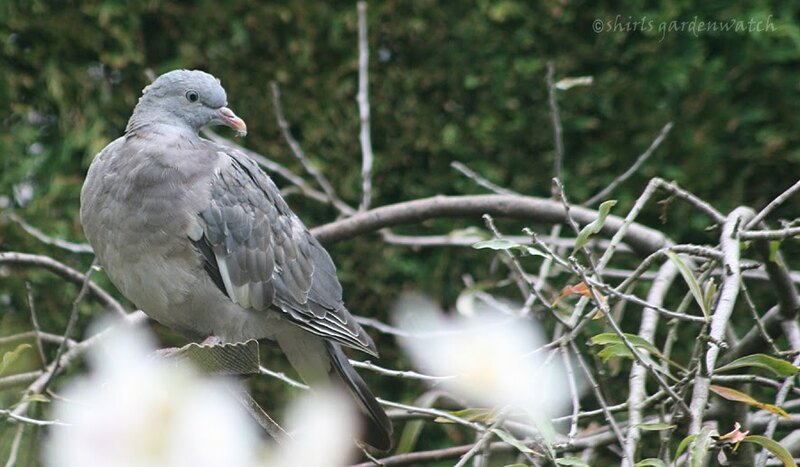 Not so easy to miss is the Woodpigeon juvenile that hangs around my garden for long spells during the day. I spotted it this morning again. I get nervous watching it. I really hope the Sparrowhawk misses it. Don’t know if it would be too big to catch but it is a very easy target when in my garden. Finally, it’s very easy to miss empty birds feeders when I have them scattered around the garden. The speed at which they go down is dependant on temps/weather outside. Rainy, windy days bring in lots of birds here. It has been dry the last few days but the food has gone down quicker than I expected. I’ll get outside in a little while, take them down, give them a clean, refill them and get them back out again. I have a feeling my garden will be hard to miss this afternoon! 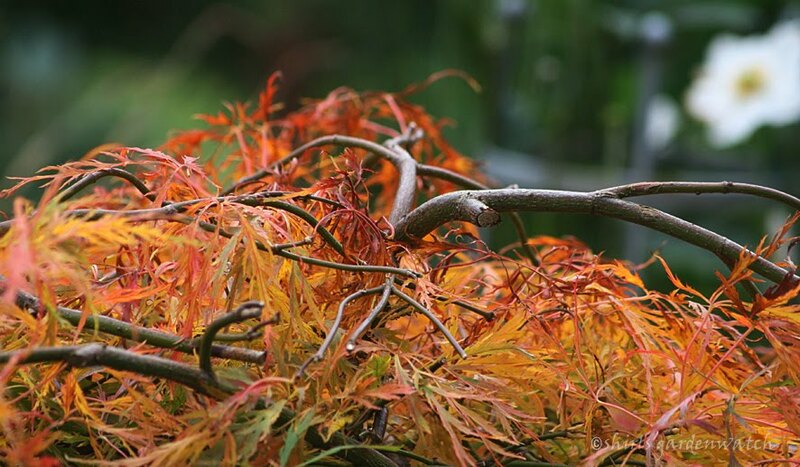 What’s easy to miss in your garden? Well Shirl. I wouldn't have believed it about the spider and the mealworm if you hadn't shown it happening. I have never thought of any British spiders as being hunters. Very well spotted piece of activity. A most interesting post, Shirl :) The spider behaviour was fascinating, well done for spotting it! I hadn't seen any butterflies here for weeks so was very pleased to spot a beautiful Red Admiral on Monday although not in my garden. 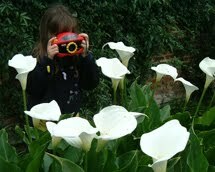 In answer to your question, 'What's easy to miss in your garden? 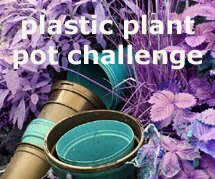 ', The answer would have to be flowers at the moment as I have had so little opportunity for gardening this year and the garden has suffered for it. Hopefully next year I will be able to put that right. It would also be easy to miss birds at the moment too :( as there has been a Sparrowhawk around for a few weeks which has deterred the usual visitors. I have to say I’m surprised I spotted the behaviour myself. I guess the first one that caught my eye (not recorded) was in a more noticeable position on the screen. After that I looked more closely. Interesting Jan that you and Helen above haven’t been seeing many butterflies this year too. My Red Admirals were the first in ages also. We're enjoying Autumnwatch too, and also glad to see it once a week (wish they'd do that with Springwatch). We're glad to see it without Simon King though as we felt his bits had got a bit samish, especially all those deer - it's interesting to see some new people doing different things (hoping for more Gordon Buchanan too). Loved the wildcat. That "walking mealworm" is amazing! I believe there are several UK spiders which hunt for food rather than building webs, but I've never seen anything like that before! Very well spotted. 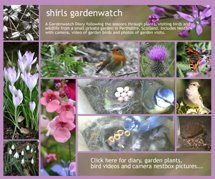 PS I meant to thank you again for your tips on how to put videos from Youtube into blog posts (some time ago) - I finally got round to having a go, using your instructions, and they were very helfpul! Ah yes, I loved the wildcat too. Yes, I would tend to agree that some new faces for presenters is good. I am looking forward to seeing Gordon return too. I agree completely about the walking mealworms. I’ve never seen it since although I’m not looking via the cameras every night and I do switch between two. I wonder how I missed this post. It is a fun post with all the video. I am glad you linked back to it. We haven't been feeding as heavily in our garden this summer due to the over abundance of House Sparrows. We have had a Cooper's Hawk trying to keep the numbers down but the picky bugger keeps taking doves and cardinals. UGH... I don't blame them though. So much more to the larger birds. I wish it would take some of the mice and voles here. I would love to see what is happening around our feeders at night. Maybe one of these days I will get a night camera. It looks like such fun. 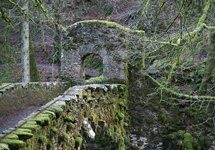 Hi again Lisa, I wondered if you had missed this post and that’s one of the reasons I linked back to it. I thought you would enjoy the footage. Funnily enough last night I came across a web page with info on what foods your birds eat. I’m going to post on it at some point. I found it very interesting. 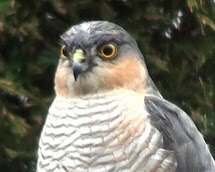 I’ve also heard other US garden bloggers mention losses with your Cooper's hawk. Isn’t it just the way that they take the birds you want to keep. I feel the same about the Sparrowhawk. Can it not take the diseased birds. Then again these fat looking finches aren’t actually fat but instead swollen. Sadly, beneath the fat exterior there is only a skeleton as the birds are starving to death. I guess the Sparrowhawks have found that out. We’ve only the odd mouse here that I’ve seen. Never seen a vole. Neighbourhood cats are always wandering by at night and stopping in the areas that I have seen the wood mouse. I guess they will be keeping numbers down here.